Gender-based programming in Multicultural Services focuses on academic, cultural and personal support needs of Men and Women by race and ethnicity. These communities are served through personal and professional development, experiential education, and community building activities. Programming incorporates multiple formats, including collaborating with various academic units, faculty, staff and former student networks, student affairs departments and various student organizations to ensure the programs are appealing and relevant for the target audiences. The Aggie Black Male Connection (ABMC) engages black males at Texas A&M with a variety of developmental, community service, social, and educational activities that build camaraderie among the black males on campus. ABMC has outcomes for students to (1) develop a sense of mattering and connection to the institution, (2) work together toward a common purpose, and (3) learn to serve as role models and build community with other black males. The goals of ABMC morph each year as the voice of black males on campus is captured, however, there will always be a focus on development and building community. Based on findings from assessments with black male Aggies and the annual black Male Think Tank, an event co-sponsored with the Distinguished Gentleman’s Club (DGC), ABMC will focus on community development and community service until the next round of black male assessments is completed. ABMC consists of a leadership team and members. ABMC leadership will experience the impact of being both mentor and mentee as they serve as part of the support system and ABMC community. The leadership for ABMC is a team who is selected in the spring. Leadership works in conjunction with their advisor to coordinate all activities for the year. All coordinated activities of ABMC target the members. You do not have to be a member of ABMC to attend some programs, however, to participate in service activities or any coordinated activities in the name of ABMC you must be a member. Latino Males United (LMU) is a program which allows Latino males a healthy environment to express relevant issues surrounding their specific community and assists in their holistic development and support at Texas A&M University. LMU focuses on mentorship, masculinity, ethnicity, academic success, leadership, and service. La Junta is a place where members come together for workshops/meetings to have candid conversations around a variety of topics. Planned topics include: ethnicity, masculinity, leadership, relationships, and members also get the opportunity to initiate topics relevant to them. Mentorship is an important component of the program where members get the opportunity to be mentored by their peers at Texas A&M University. This will be a year-long one-on-one mentorship where mentor-mentee will meet several times a semester. Members will also get the opportunity to mentor at-risk youth (specifically elementary/middle school Latino males) in the Bryan/College Station community. This may be a regular one-on-one commitment for a whole semester with the hope that it becomes a long-lasting relationship. The annual LMU Excursion is a two-day high impact experience where we visit a major city in Texas. The purpose of the excursion is to allow members to explore their identity in what it means to be a Latino man, develop professionally, be a service to the community and explore the historic culture of the area. Some components of past experiences include visiting underserved K-12 schools, networking and learning at 2-3 corporate office visits, exploring different cultural museums and engaging on a reflective project. 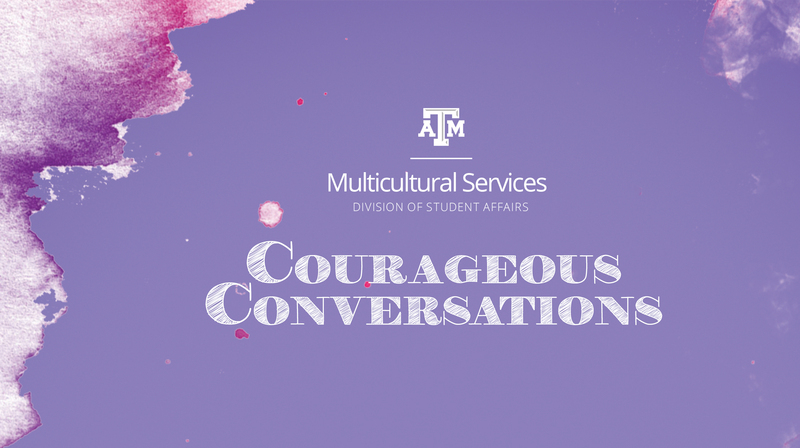 Courageous Conversations is a program designed to positively impact the collegiate experiences of undergraduate women who identify as Asian American, Black and Latina through themed dialogues. Given the process of forming identity, wherein a sense of self-develops through growth in self-understanding, self-concept, individual differences from others, and social roles, Courageous Conversations target the psychological and emotional wellness of Women of Color through the lens of racial and ethnic identity. This program provides a healthy environment for the exploration of issues surrounding students’ specific communities and assists in their holistic development and support at Texas A&M University.